I once went to a Swedish film with a friend, and when the movie started with subtitles running along the bottom she turned to me and said, “Wait. 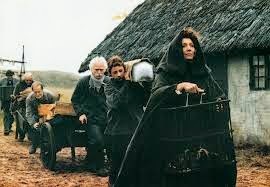 This movie is IN Swedish?” So, with that moment in mind, I will straight away tell you that this movie, Babette’s Feast, is in Danish, and Swedish, with a smattering of French – but the subtitles are in English. This isn’t a talky-talky sort of movie with lots of darting and witty conversation, so having to read the translation of what is said isn’t arduous. 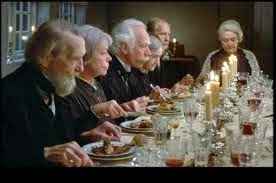 Babette’s Feast won the Academy Award for Best Foreign Language Film in 1988, along with many other accolades around the world. I love this movie. It’s a quiet, gentle film based on a short story by Karen Blixen (who also wrote Out of Africa). For all it could be considered a small movie, it finds a way to settle deep within the viewer, sinking into the quiet, reflective place in the mind where it can be brought out and pondered from time to time later. Like any good story, there are poignant moments, prudent touches of humour throughout, and lines of dialogue that you realize are telling you something True. It is the story of two daughters of a Protestant minister in a very small village in Jutland, Denmark. They are beautiful and talented and kind, helping their father in his work and caring for those in need in their community. Suitors come and suitors go (discouraged by Papa), and the daughters carry on in their usual routine of good works even after their father dies. One bleak night Babette appears at their door with a letter of introduction from one of the long-ago suitors. He asks the sisters to take Babette in, as she is a refugee from Paris who has lost her family to the revolution. “She can cook,” he writes. And so she stays with them and the years go by. She patiently allows them to teach her how to soak dried fish then boil it, and how to soak bread in ale to make some sort of soup. Oddly enough, after Babette takes over the kitchen, money goes further than before and the food tastes better – a fact gratefully appreciated by those in the community the sisters were feeding. Meanwhile, grievances and squabbles are taking over the little congregation. They take to snipping at each other and rehashing old hurts. The sisters decide to host a simple celebration in honour of what would have been their father’s 100th birthday – for a little party is sure to remind them all of what he used to teach them. The best laid plans, however, are often derailed so that we can learn something important. Circumstances arose to allow Babette to change their plans of a simple meal with a cup of coffee to a luxurious French feast the likes of which that little group had never seen. The whole village was amazed to see the ingredients brought by special order from across the sea. The members of the congregation – a Puritan-leaning sect – agreed that in order to not be tempted by their senses they would partake of Babette’s meal but not take any notice of what they ate or drank. Of course we know that happiness experienced through the body can bring mellowness and contentment, and that the well-being following a meal shared with family and friends encourages cordiality and charity and forgiveness and all sorts of good things. 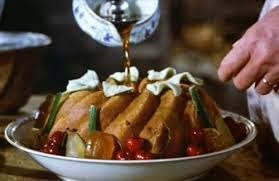 The ‘Babette’s Feast’ scene is a delight on many levels: it is beautifully filmed and well acted, and perfectly simple; watching Babette prepare the meal is intriguing while the food and the set dressings are sumptuous; seeing the effect of it all on the diners is Chestertonian – I just know G.K. would have appreciated the way food and wine and conversation restored friendships, healed old hurts, and melted hearts – and it is ripe with symbolism in that the meal represents charity, love, and generosity. We understand without being told that a need within Babette was being fulfilled by being able to serve this meal to these people. 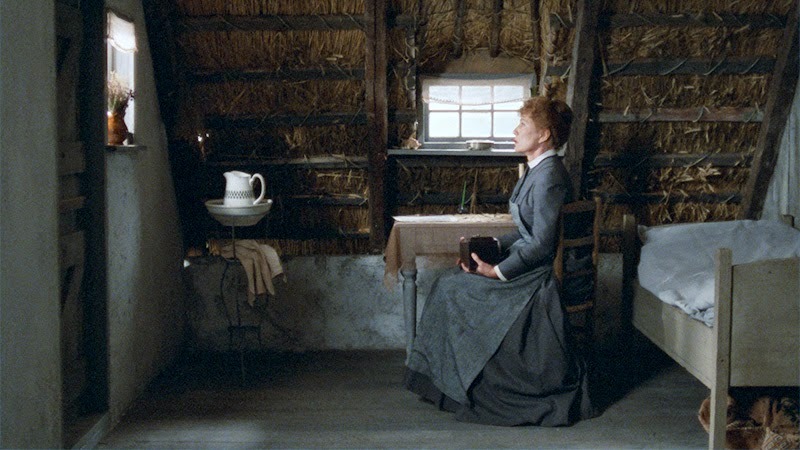 Because Babette’s Feast is a simple story well told, there is room for the viewer to take from it what they will. There is plenty of meaning to be gleaned if you look for it, or it can just be a gorgeous piece of Danish cinematography. Either way, there is grace through art, and grace aplenty in this movie. I heartily recommend it.